After a tough few weeks fighting my way through endless amounts of amazing wine, goat’s cheese and almond croissants in France I’m back. For the first part of last week it was all rice and noodles (there was talk of juicing but I didn’t quite make it that far). I thought I’d never eat cheese again I’d gone so overboard. Of course I soon got over that as this week’s recipe shows. The simplicity of a lot of the food we ate really hammered home the whole quality produce argument. You don’t actually have to eat as many pastries and cheese as we did (no, really you don’t) and the natives wouldn’t dream of it. It’s really all about fresh seasonal produce at its best so yes you eat the odd amazing pastry but really there’s a lot of salad going on most of the time. When we were there the peaches and melons were hitting their peak and both nothing short of spectacular. The melon in particular really stood out for me. We had it in several places with some cured ham and a handful of lightly dressed leaves and it made the most exquisite starter, a far, far cry from the anemic varieties we’ve all had in this country that just makes the dish seem so pointless. this is just one example, I’ll do a few recipes inspired by the trip over the next few weeks to give you a flavour. At this time of year in Ireland we mightn’t have peaches and melons but we’re spoilt for choice with veggies. This week brings a welcome return of baby beetroot from the Healys. It comes with leaves attached and these are even more nutritious than the actual beets so be sure and use them. You’ll have to be quick as they’re fragile and won’t last. One simple idea would be to roast up the beets finishing them off with some balsamic then serve them with a handful of walnuts with the leaves. Make a nice mustardy honey dressing for this like the one below and serve with some goat’s cheese and crusty bread and you’ve got a brilliant light lunch or starter. I decided to use my beets to make a very simple salad that is amazingly moreish and way more than the sum of its (2) parts. It’s a recipe from my friend Helen and I think it’s Polish originally. 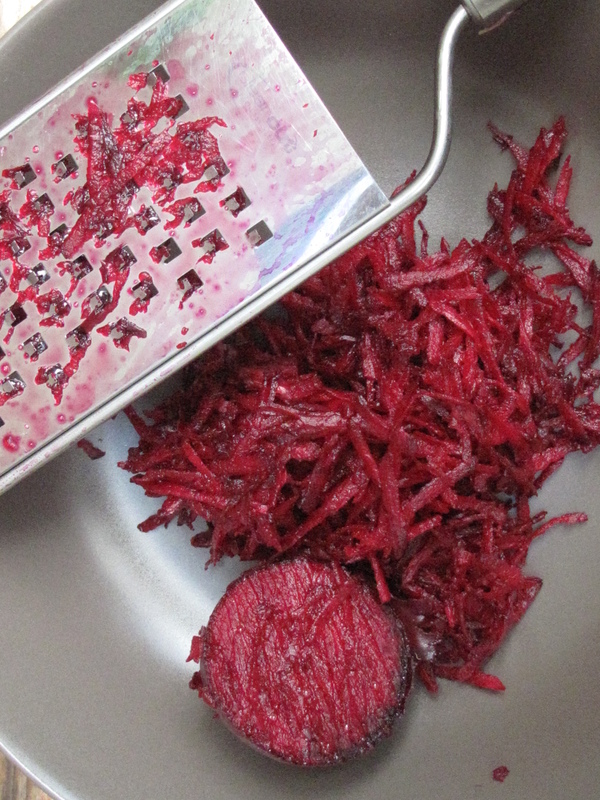 Basically you grate the beetroot and dress it in lemon juice and ……..that’s it but it really works. Summer is all about courgettes and they will be coming thick and fast til at least the end of September so I thought that a courgette recipe might be in order in this week in case of you are suffering from what we call “courgette fatigue” at Home Organics. Some of you have the very pale ones that are known as the white variety that you can see in the photo. Don’t panic as Claire did when she saw them arrive this morning – they’re the same as the kind you’re used to just a different colour . 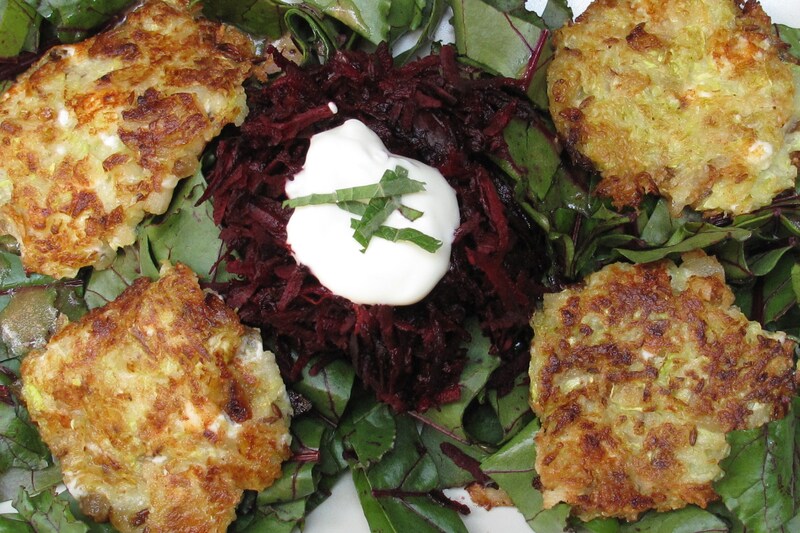 I made fritters with feta and a little mint from the garden which I served on a bed of the beetroot leaves with a honey mustard dressing alongside the beet salad with a dollop of greek yogurt. It makes great lunch for two or a starter for 4. I know it sounds like this dish has lots going on but I promise you can make it from scratch in less than half an hour. 2 tablepoons breadcrumbs ideally the Japanese Panko kind which are extra dry so great for absorbing any excess courgette moisture. You’ll get these in any Asian supermarket and they can be kept in the freeezer. Courgettes are full of water so begin by coarsely grating them onto a cloth. Leave for about 20 minutes to allow some of the excess water out. You can even get them into a ball in the cloth and wring them out if you feel that they’re still quite soggy after the 20 minutes. While the courgettes are sitting, heat some olive oil in a pan and begin sautéing the onions with the cumin. You want them a deep golden brown and starting to caramelize and this will take about 20 minutes over a low to medium heat. Be sure and stir them around every five minutes and add a pinch of fine salt halfway through. With the onions and courgettes on the way, get on with the beetroot. 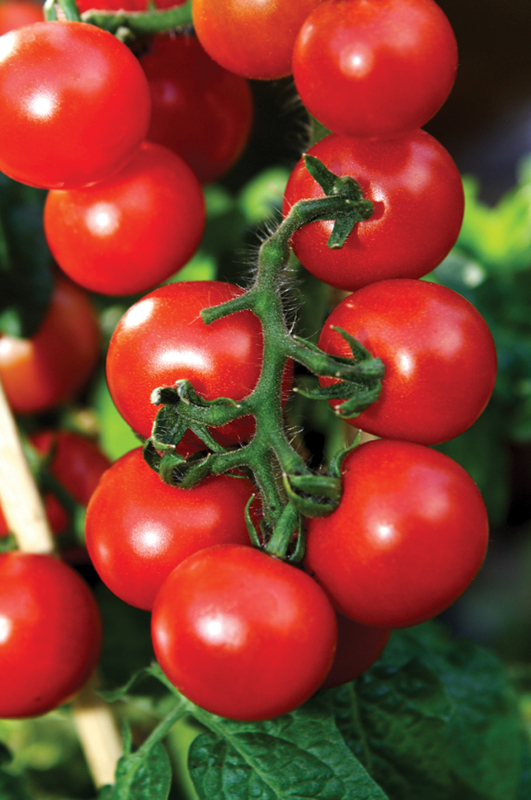 Remove the leaves and set aside then coarsely grate each bulb and dress the lot in lemon juice to taste then set aside. Prepare the salad dressing by whisking all the ingredients together then set aside til the fritters are done then simple toss with the leaves. When the onions are ready let them cool a little then combine with the courgettes, feta, flour and mint. Add a pinch of salt and plenty of freshly ground black pepper and mix well. Heat some oil on the pan the gently add about 1 tablespoon of the courgette mixture for each fritter. Gently flatten each one out with the back of a spatula then fry til golden. Turn over carefully and fry the other side. Remove from the pan and serve on top of the beetroot leaves with a dollop of Greek yogurt and a serving of beetroot salad on the side. Heaven. Like everyone, we’ve all been sickened and very saddened by the images reaching us from East Africa at the moment. This week we will be donating all the takings (not just the profits) from any new orders to Oxfam so if you know anyone who’s been talking about giving us a try please let them know. yummy looking stuff, bless your day. Delish!! This is a lovely dish, made it for friends last night and it went down a storm.